BECCARELLI P., MAFFEI R., LUCHSINGER R.H. and CHILTON J., 2015. 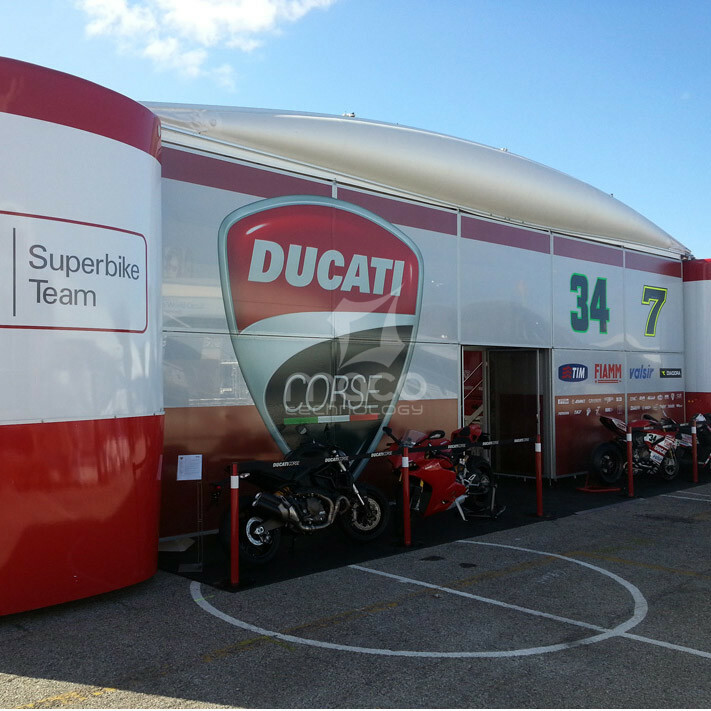 Ducati Superbike Pavilion: Design and Manufacturing of a Tensairity® Roof In: Structural membranes 2015 VII International Conference on Textile Composites and Inflatable Structures, 19-722 October 2015, Barcellona, Spain. Key words: Tensairity, Coated Fabrics, Ducati, Pavilion, pneumatic, beams. L’articolo presenta in modo dettaglato la progettazione e le fasi di produzione del padiglione temporaneo per il Ducati Superbike Team. La prima parte descrive il padiglione dal punto di vista architettonico, le dimensioni, i componenti e i requisiti del cliente. La seconda parte analizza gli aspetti strutturali e il comportamento sotto carico del tetto Tensairity®. La terza e ultima parte si concentra sul montaggio e sullo stivaggio della struttura in fase di trasporto. This paper offers a detailed overview of the design and manufacturing aspects faced during the design and construction of the Ducati Superbike Pavilion. The first section of the paper describes the architectural design of the pavilion, the size of the components and the requirements of the client. The second section analyses the expected load bearing conditions and the structural design of the Tensairity® beams. The final paragraph presents the details and the assembly of the roof.